If you're a fan of Terry Pratchett, then this is the group for you! Whether you're young or old, pull up a chair, hand over a banana to the Librarian and get handed a book in return. With any luck it'll be one that won't send you hurtling into the Dungeon Dimensions, but will feature some well-loved characters from one of the many guilds within Ankh Morpork, or perhaps the not-coven of Witches from the Ramtop Mountains. Beware if you try to steal a book away though - The City Watch are more than capable these days. 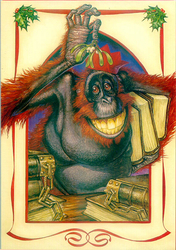 And of course, the Wizards might get tetchy if you upset the Librarian (don't say monkey! ).